College students often feel high levels of stress and pressure. New experiences make life in college exciting, but they can also leave the student feeling overwhelmed. Stress arises from a variety of areas, managing independence, creating new relationships, academic demands, and not sleeping well. Most students successfully cope with this new life; but more and more, are becoming overwhelmed. A significant number of college students have their educational and personal lives disrupted by psychological problems. When psychological difficulties go untreated, the results can be problematic and exacerbate the consequences in their life. The consequences may include academic failure, withdrawal, and other serious concerns. Many psychological problems have high rates of recovery if appropriate help is received in a timely manner. Unfortunately, many students fail to get help. Failing to get help occurs for a variety of reasons, including, not knowing the on-campus resources available to them, not understanding the warning signs, denial, and a lack of support. In working out the vision and mission of HIU we have the distinct opportunity to support our students in ways that will impact their ability to live out the calling God has on their life. At Hope International University each student is valued and is a part of a caring community. As a community of care, we reach out to each other in times of need and work together to build a healthy and well campus. The efforts we all make- faculty, staff, and students- promote and nurture a community of care and support. 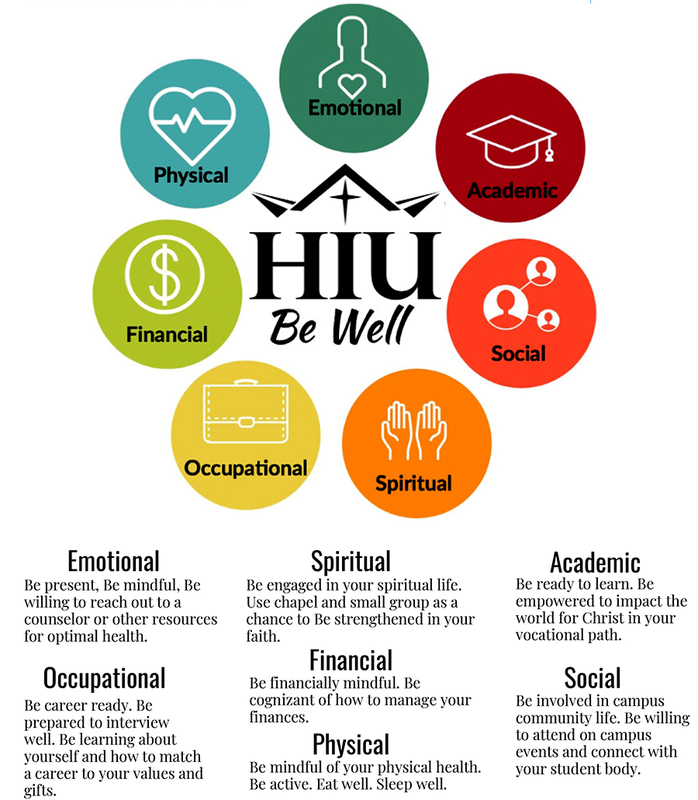 Student Affairs aims to provide support to students in 7 key areas to BE WELL. The Office of Student Affairs serves as the location for health and medical service information. The Residence Life Staff can assist resident students with minor first aid needs, but all students requiring additional care will be referred to offcampus medical care providers. The Hope Counseling Center provides high quality counseling and consulting services at a low cost to University students, faculty and families as well as to the local community.